By way of background the CAA introduced CAP1687 earlier this year and Article 94B covers flight restrictions on flights that are over or near aerodromes. 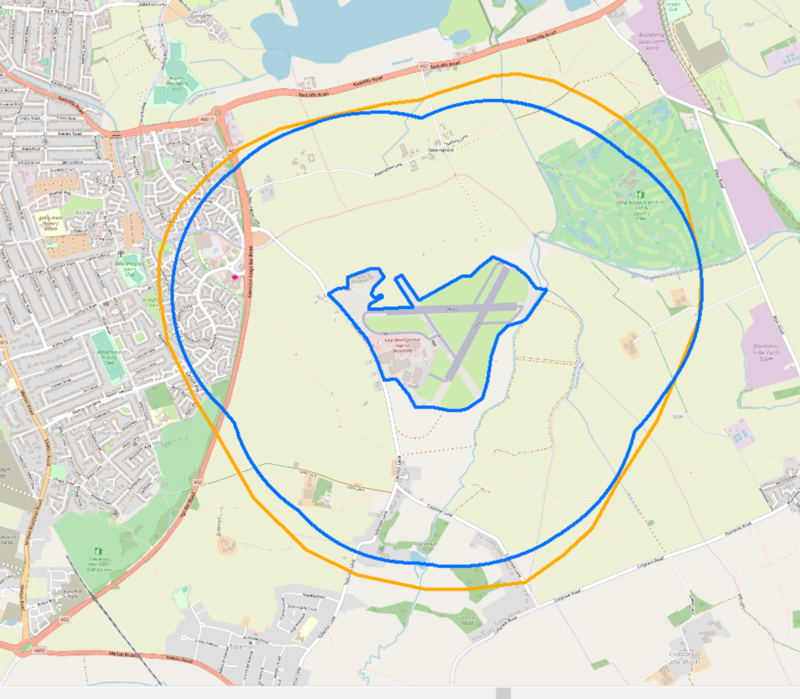 The CAP included defintions for the "Inner Zone" - consists of the area over the aerodrome and upto the aerodrome boundary and the "Outer Zone" - a ring of airspace outside of the aerodrome between the Inner Zone and a line 1km from the aerodrome boundary. Subsequently these areas have been incorporated in the NATS Drone Assist app. 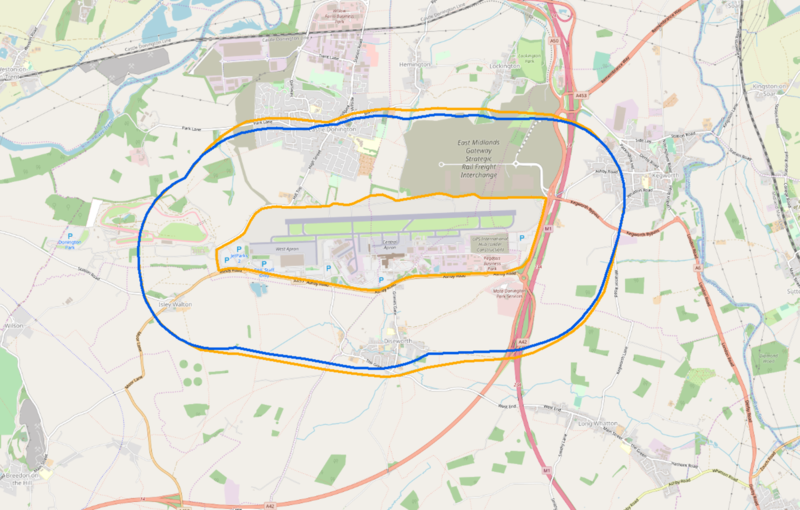 My intial investigation with regard to the extent of the Outer Zone related to East Midlands Airport. Defining the bounday of EMA was a simple task using both NATS and OS map data. Is it a simple polygon and the boundaries are clearly defined on the ground. I think this will be true of most airfields. The plan right shows the extent of the Inner and Outer Zones shown by the orange lines. As a point of note the extent of the Outer Zone has been taken from the NATS Drone Assist app so I can't rely of 100% accuracy when viewing the data on a mobile phone. The blue line shows the extent of a 1km around the Inner Zone. The variance is not large but there again it isn't accurate or in accordance with CAP1687. For the blue area I have definded I used ArcGIS to create a 1km buffer from the extent of the Inner Zone. In the north western part of the site the difference between the NATS defined area and my area is circa 80m. As to why there is a discrepancy may simply be down to the GIS software used to create the "Outer Zone" unless of course it was done using some other software. It certainly looks like a typical buffer which is the tool which would be used to create the area. Possibly it could be something to do with the projection of the map being used at the time. To check that that this isn't a one off I looked at Nottingham (aka Tollerton) airfield. I have followed exactly the same approach. Again you will see discrepancies particularly in the north east quadrant and along the south side. My thinking is that other airfields are going to result in the same findings. I did have a quick look at Doncaster/Finningley and there are variances. I haven't mapped these. With regard to drone operations it is better that the area is larger, it does give a better safety factor. What would be the scenario had the error been the other way and NATS showed a smaller area than the CAP1687 definition and you were flying a drone there?